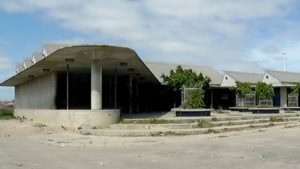 There appears to be no end to the infighting between residents of Port Elizabeth about whether or not the multi million rand Red Location Museum must be opened. The museum, which has won countless awards for its design, has been closed since October 2013. Sections of the community won’t allow the museum to open until their housing demands have been met. It is one of only two anti-apartheid museums in the country and was meant to be an economic lifeline for the Red Location community. A project that was meant to alleviate poverty in the area is now nothing more than an eyesore; vandalized, abandoned and left for ruin. The main issue is the proposed building of 40 square metre houses in the area. These houses would be smaller than the current 48 square metre houses that were previously built. The community is also aggrieved that locals were not employed by the museum. Msesiwe has lived in this house for most of his life. It’s 48 square metres, and was built by the municipality. He has maintained his home using his pension. Msesiwe says that the community is at a standstill. Under the rectification programme, residents were promised their homes would be fixed, but of the 373 homes to be rectified, only 100 were done. Now the municipality wants to demolish the homes and build smaller ones. All attempts to get a response from the municipality were unsuccessful. The post Disgruntled PE residents keep museum closed due to housing demands appeared first on SABC News – Breaking news, special reports, world, business, sport coverage of all South African current events. Africa's news leader..